New web technologies have rapidly gained momentum in the market by 2017, particularly the front-end technologies. An upsurge in the demand of conversion services (from PSD to WordPress) proved to be beneficial in boosting online business growth. 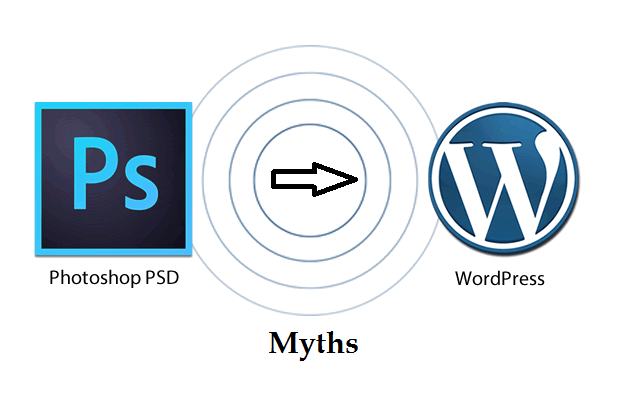 Nonetheless, certain myths concerning PSD to WordPress conversion annoy web developers the most. Hence, it is the rightful responsibility of every digital agency to be aware of such fake facts and myths for the betterment of their projects. Myth: High traffic is unattainable with WordPress websites and when it is, the websites go down. Truth: Hosting and other technical issues are to be blamed if the site goes offline. These issues could be easily resolved by hosting your website on a trusted and secure server. Myth:WordPress works well only for SMEs. Truth: This myth is absurd. Highly-reputed brands such as Disney and Best Buy still use WordPress and they do find it pretty useful. Myth: WordPress is only a blogging platform. Businesses can’t benefit from this since obtaining a feature-rich e-commerce website may not be feasible. Truth: Being a full-fledged CMS, WordPress is furnished with numerous e-commerce plugins making it ideal for businesses. There are plenty of e-commerce giants out there using WordPress, like eBay. The generation of high revenues from an online store like eBay is very apparent. Myth:WordPress is an insecure platform. Truth: WordPress wouldn’t be chosen by prominent brands in the first place if it is not secure. Developers at WordPress constantly check for the presence of any bugs, loose strings and loopholes. If the tests are positive, it is immediately notified to the WordPress officials. In fact, WordPress promises a safe environment and offers impeccable security for their users. Security plugins could also be used to enhance the security levels. Examples of popular security plugins for WordPress include BulletProof security, Sucuri Security andWordfence Security. Myth: The security aspects affect the reliability factor. One of the famous rumors of all times was that WordPress plugins are not secure. Truth: This has been put up incorrectly. If you feel the need of adding new features to your website, you’d opt for Plugins. These must be chosen by the admin and thus the admin could examine the reviews and ratings of the plugins before adding them to the site. Don’t forget to update the plugins regularly. Above and beyond, these plugins are completely secure following coding protocols. Myth: WordPress is an easily hackable CMS. Truth: This is not true. Frequently backing up the WordPress site decreases the odds of the site being hacked. This user-friendly CMS provides a secure environment (advanced if plugins are included). We can definitely not overlook the pros of such a website by falling for fake rumors. Custom websites can be created by using complex plugins called WordPress drag and drop page builders. One step ahead, advanced users rely on these tools to effectively complete their complex tasks easily. Revise the facts and myths about builders if you plan on using these tools for your business website. Myth: WordPress websites load slowly if Page builders are used. Truth: Page builders, in reality, are super-fast and can load complex designs in a lesser amount of time. Loading time is directly proportional to the manner in which the content is structured on a website. Other factors that disturb the loading time of the page are Page level caching and Builders using short code. But if these plugins are rightly coded, the site speed would remain unaffected. Myth: Free templates or themes are not supported by WordPress. Truth: This only makes development easier. There are plenty of forums available to lend you a hand in case you have any queries. Full-support is provided here free of cost. The most flexible platform (concerning the maintenance of a website) to count on, if you wish to make a website for your business, is the WordPress CMS. This CMS is largely being used by business giants such as Forbes and TechCrunch to attract more traffic. The aforementioned points exposed some common myths about WordPress and also supported its incorrectness with a detailed account on the truth. You can now clearly picture the strong aspects and importance of a CMS like WordPress. The PSD to WordPress theme-conversion is a herculean task which also requires a great deal of money and expertise. Instead of hiring web professionals, you are welcome to get assisted by our conversion professionals at reasonable prices. Contact PSDMarkup today and get your WordPress conversions done gracefully by experts.